John gives us the low down on PT. Dolores takes on cook book labs and offers suggestions on how to make them more open-ended. Please add your own pseudoteaching story! Action-Reaction isn’t turning into an edtech blog, I promise. However, my students and I have been using JayCut (a free, online video editor) to create video lab reports and video demonstrations from clips taken with our Flipcams. The picture-in-picture effect is really just a transition, but I made the transition last for the duration of both video clips, rather than having one clip transition to the other. In addition, you can see that JayCut allows you to add titles, still photos, and upload your own audio. I know this group’s experimental design can be improved, but I wanted you to see some actual student work. Doing a video was a choice — other groups wrote a more traditional report or presented to the class using whiteboards. When your movie is complete in JayCut, you can publish the video to YouTube, publish it to JayCut’s own site, or download the file to your computer. You can also get an embed code to put the video into a webpage, blog, etc. without publishing to YouTube. (I find the YouTube version to be higher quality, though.) When my students made video lab reports, they got the embed code and put their video on our private Edmodo class page. JayCut will store all the clips, stills, audio, etc. you upload into your media library so you can use them over and over again. You can save your work and finish later. I don’t know of any file size limit or storage limit. I really can’t believe the site is free, and there’s also no advertising. You do have to sign up for an account, but I have not received any email or spam from JayCut. That’s it. I just wanted to show everyone what JayCut can do! 1. Stop motion movies and flip books. 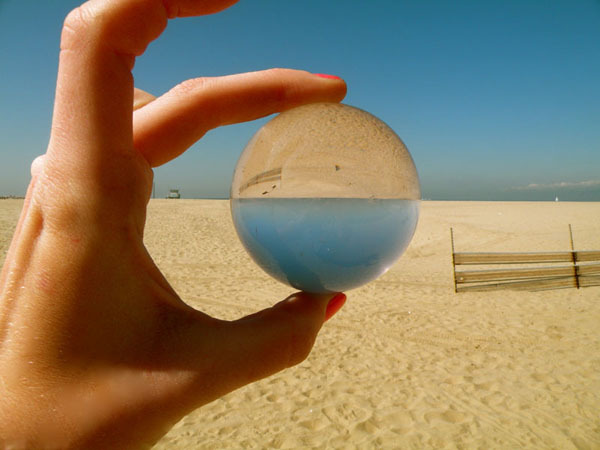 By taking multiple pictures, students would create a photo flip book or stop motion movie to demonstrate, as accurately as possible, a particular science concept or process. For some examples, see Dale Basler’s post Create stop-motion videos and learn physics. Another way to easily create stopmotion films is with SAM Animation software (more examples) and a webcam. Take photographs of lab setups so you’ll remember next year how you set it up. Embed the photos into lab handouts and add annotations and directions. Students take pictures and explain the all of the science concepts present in their photo. Display student work in the classroom and around the school. ﻿It drives home the concept that science is everywhere! Exceptional work in physics could enter the American Association of Physics Teachers’ High School Physics Photo Contest. This is different from #3 in that students would need to take a photo (student-created or teacher-created) and mathematically analyze it. For example, students could photograph the water coming up out of the water fountain. 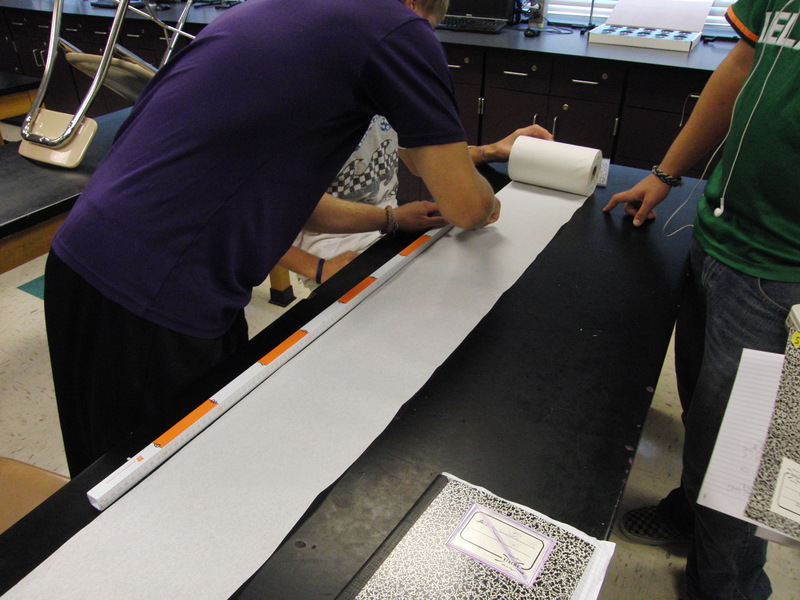 From the size and shape of the parabola, students could determine the initial speed of the water and the time it spends in the air. See also Speeding Problem and Kobe, Karplus, and Inquiry. Students would take pictures with the shutter open a little longer than normal to capture motion. Attaching LEDs to the subject would allow for “light traces” in the photograph. See Sebastian Martin’s A Different Physics Class. Many cameras have a video mode. It could be used to film an event that takes such a short time (less than 2 seconds) that using a regular stopwatch would yield poor results because of human reaction time. For example, students could measure the time it takes a ball to fall from the ceiling to the floor (which is less than 1 second) to determine the gravitational acceleration. Recently, we were doing a lab where students studied how the spacing between dominoes affects how quickly the line of dominoes fall. Students were getting messy data because the falling times were so short. If students had taken a video of the dominoes, they might have gotten more accurate falling times because they can look at it frame-by-frame at 30 fps. 7. End-of-year slide show for final exam review. Make a slide show from pictures of students doing lab work and participating in demonstrations. At the end of the year, use the slide show to review for the final. Ask the students if they remembered what happened in the lab/demo and what concept it demonstrated. Plus, it’s a great way to remember all the good times during the year! In groups of 3, my students often write-up problem solutions on large whiteboards and present them to the class. Taking pictures of the whiteboards and archiving them on the class website would be perfect for student review and for students who were absent that day. If that gets too much to handle (sheer volume), take a picture of an exceptionally well laid out solution and put it in the “Whiteboard Hall of Fame” or the “Whiteboard of the Week.” Documenting exemplary work shows students the level of expectation we have for all of them! 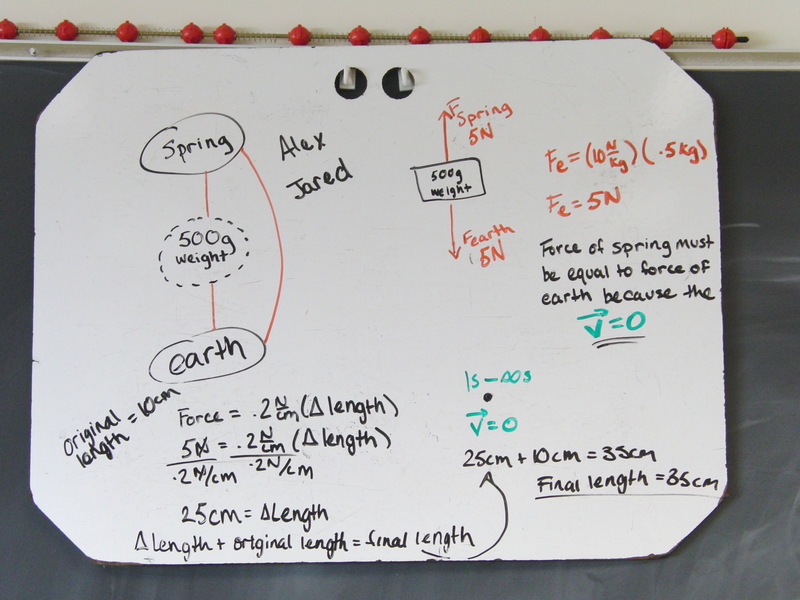 See more at Physics Whiteboards. Take pictures of students and attach to a mini biography students would submit at the beginning of the year. Display bios around the room so you not only get to know your students, but they can learn more about each other! See an example from Dean Baird. As a class create a picture dictionary where students take photos that illustrate a particular science concept (force, velocity, wave, force, charge, momentum, energy, equilibrium, etc). These pictures could be posted around the room, perhaps with equations added, as the year progresses. Much better to have student made posters than teacher ones! 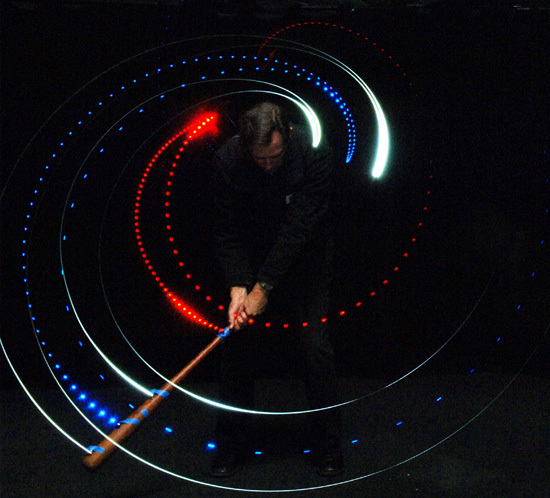 See the brilliant and clever Flickr photoset The ABCs of Physics. With all the equipment in science rooms, photo labels would be a great way to show the contents of the drawers to help students find things and to put them away. Plus, the photos would liven up the room! At the beginning of the year, all science teachers go over laboratory safety and have students and parents sign a safety contract. Creating a PowerPoint with photos of do’s and don’ts would be perfect! Plus, it could be pretty humorous. If the pictures were created by the class from the year before as a final project, the next year’s students would enjoy seeing their friends in the photos. In the above video, which cart felt more force? (i.e., which cart’s hoop flexed the most?) When debriefing after a demonstration, there are always a bunch of students who think they did/saw something that they really didn’t. They might be biased going in to the demo, and the demo doesn’t change that bias. By taking video of the demo, show them what REALLY happened. In the above video, students tend to focus on the speed of the carts, rather than the flexing of the hoops, even when you tell them to look at the hoops! 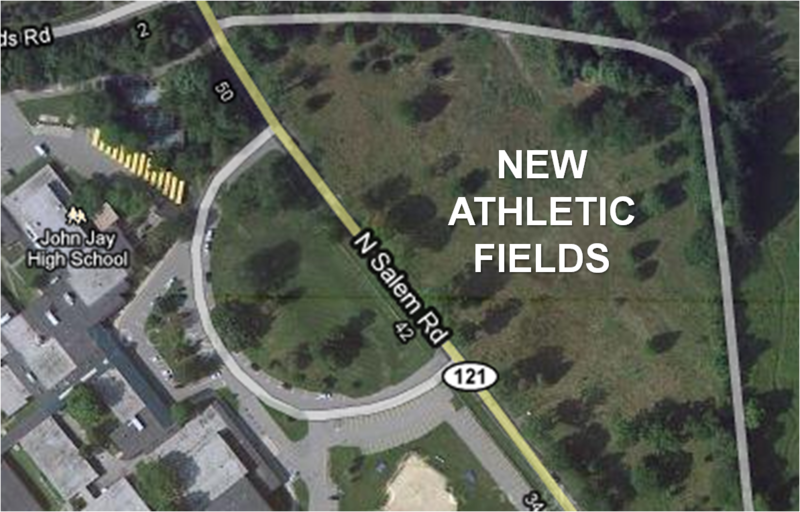 New playing fields are going to be built on the lot across the street from our school. Unfortunately, people will need to cross Route 121 (a 2-lane highway) to get to those fields. ﻿ Currently, the proposed pedestrian crossing is a crosswalk with a flashing yellow light. Is there a speeding problem on Route 121? Do you think the proposed crossing is adequate? We are videoing the traffic in front of the school with Flip cams and analyzing the videos in LoggerPro. Luckily, the fence posts are 10 feet apart and are perfect for setting the scale in the analysis! If the school had put a police officer or a “Your Speed Is…” sign in front of the school, people would slow down, and the data would not be representative of real traffic. We hope that by recording traffic from a distance, drivers will be more likely to maintain their true speed. We also hope to collect lots of data during different times of the day (different classes) to help in our analysis. 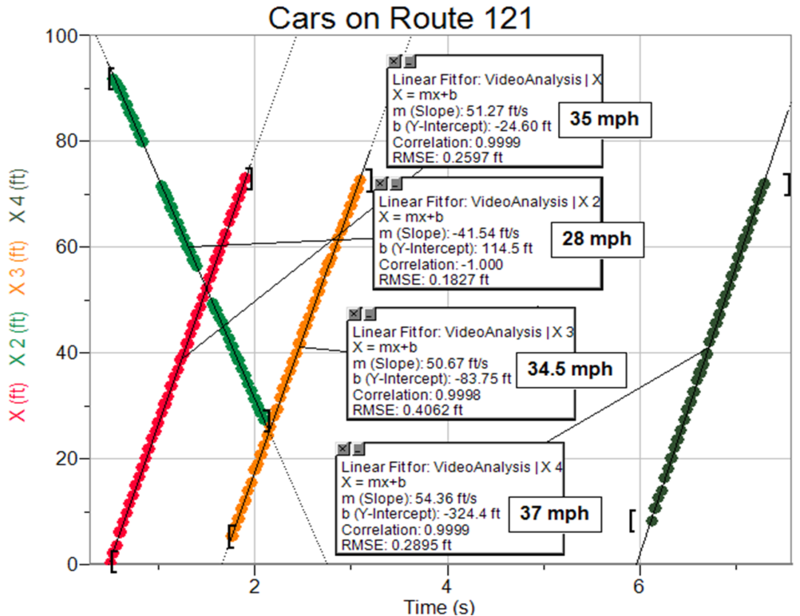 This simple activity serves as an introduction to video analysis, so students will have another data collection and analysis tool at their disposal for future labs of their own design. How Long is the Roll? Note: Some readers may need to click through to view the embedded video. 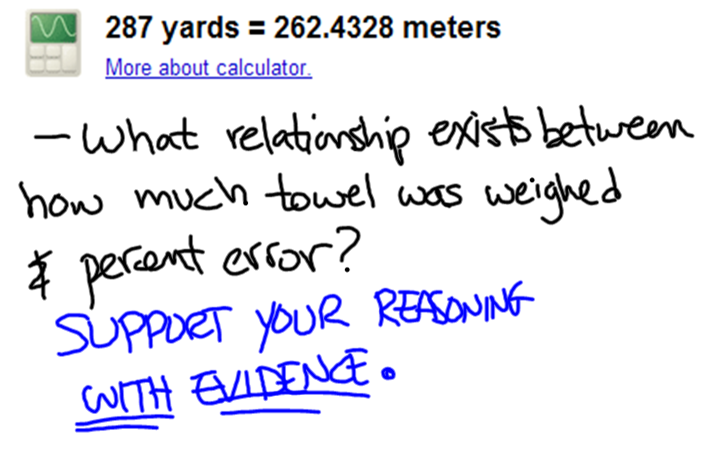 My conceptual physics class was chugging along just fine the other day. Then a kid asked for some paper towel. When I took out a giant roll from under the sink, the day’s lesson took a detour which would make Dan Meyer proud. How long is the giant roll? Class data. 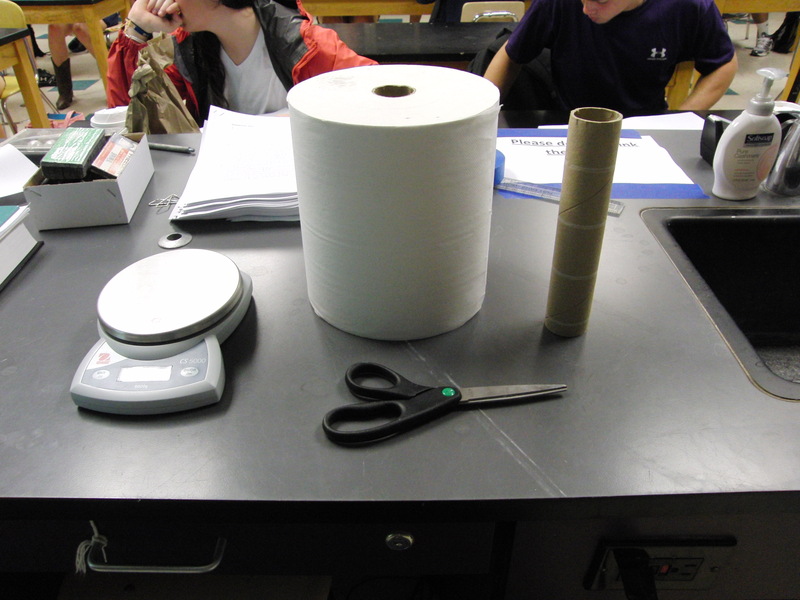 Groups measured different amounts of paper towel. 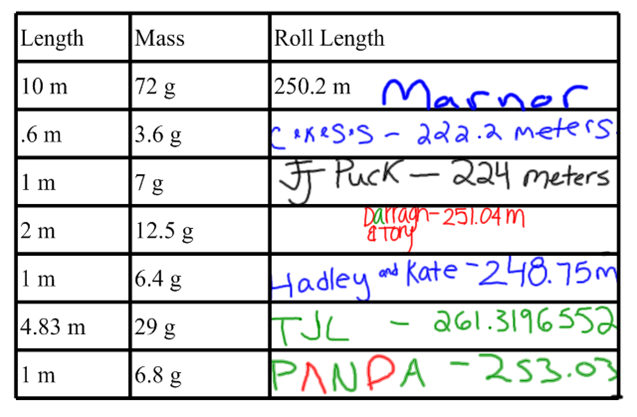 Who will be closest to the actual roll length? Final analysis with an attempted shot at evidence-based reasoning.